Thirstycats creates a variety of designs suited to the different physical and temperamental qualities of different cats. Below is a compilation of videos from both us and our customers demonstrating these differences as well as the different levels and qualities of the water sounds each fountain design provides. We call this design the Bubble-up. It is the simplest and generally the least expensive, depending on how much ornamentation went into the center piece. For example some bubble-ups have beautifully under-glazed designs and carvings and those are more expensive. The Bubble-up is one of several designs of cat water fountain, very suitable for shy or skittish cats because they are so quiet and gentle with very little water display, especially on low settings. This would not be the best cat water fountain design for longhair cats as they’re apt to get their fur wet while drinking. 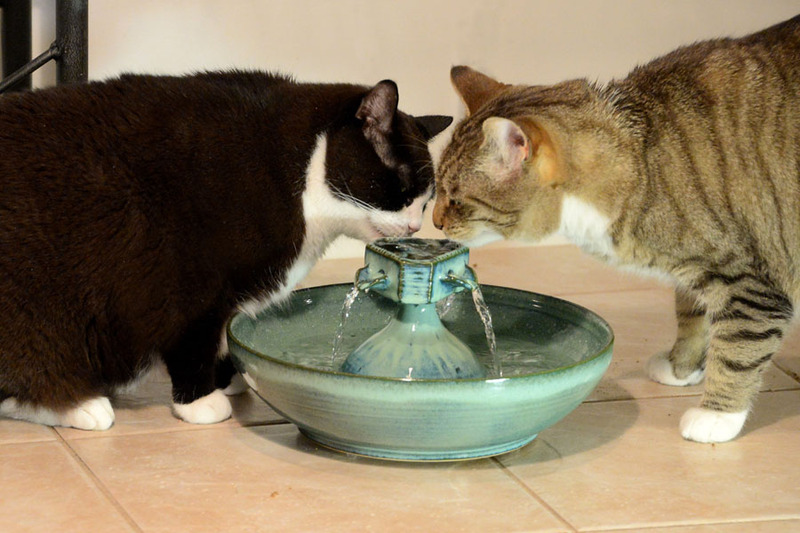 With this design of cat water fountain you don’t need to consider the size of your cats’ head. If your cat is the quiet or timid type and likes a stream, a bubble-up with a Serenity Flow add-on is a great choice. The handmade, antimicrobial copper Serenity adds $44 to the price and can be swapped in and out with the straight copper spout that comes with the Bubble-up. (All the copper we use is 99.9% pure and is antimicrobial by nature. Though we recommend it, none of the fountains needs the copper spouts to run perfectly.) The Serenity delivers a quiet, smooth stream you can adjust in volume and turn in any direction. The Bubble-up cat water fountain with the Serenity is also great for longhair cats. Notice that when Arlo isn’t drinking the fountain is quiet. Another excellent choice for both the quiet cat and longhairs is the Piazza design without any channels or spouts. Or in other words, those fountains shown in the Tall Bubble-up category. 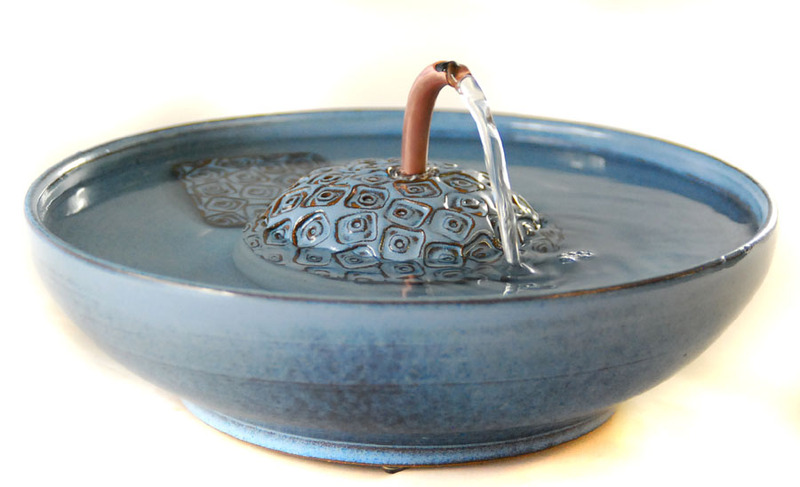 Most of these are silent fountains as the water slips silently over into the bowl. With this design your cats can drink from the upper basin without getting their fur wet. If you remove the ceramic insert that accompanies most fountains of this design you get a more visually vigorous display but it remains very quiet. 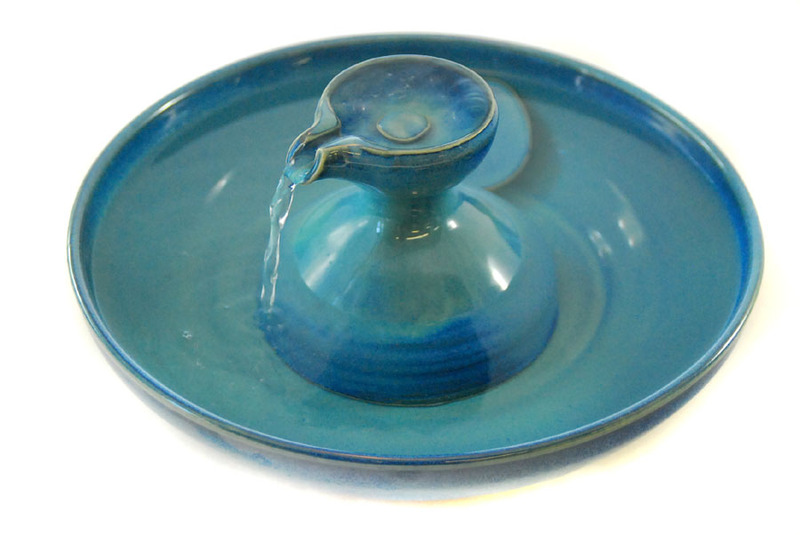 Because of the upper basin this design will always be with a fairly large fountain bowl. Ashlynne’s, below, is about 12 inches wide. She uses both the bowl and the upper basin. Notice too that the bowl is plenty wide for Ashlynne’s head. An important consideration with any fountain. We try to insure that every fountain we make is wide enough from the center piece to the edge but look closely to be sure and call if you have any questions. If you need an upper basin for a longhair cat and one that is quiet this design is probably the best cat water fountain you can buy. Many cats prefer a stream, and not just a few demand one, meowing to have the faucet turned on. Several of our customers have said they used to have to leave the faucet running because their cat would not drink from a bowl. We make many fountain designs which produce a stream, both to satisfy this craving and for their beauty. Some have one stream, such as this free-form Petunia design below, some have two streams and some have three, four or five streams. We test every cat water fountain for quality of flow, for sound and to ensure they don’t splash. We try to insure that every fountain that leaves our studio is splashless. If we wouldn’t want it in our house, we’re pretty sure you wouldn’t want it in yours. 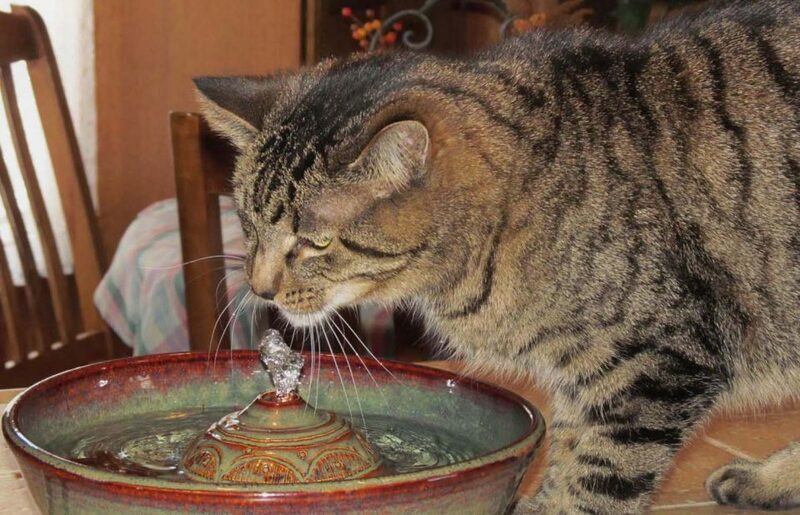 After all, we truly do try to make the best cat water fountains worldwide. 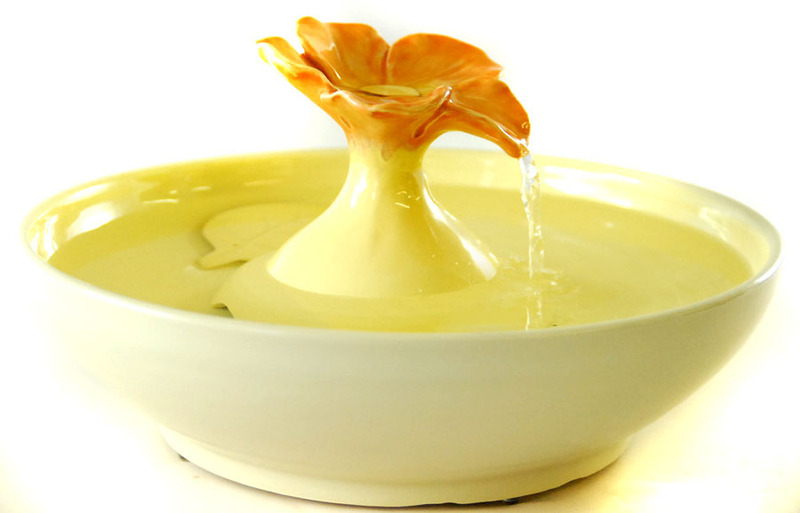 Our Sea Flower provides an upper basin, a bowl and two streams from which to drink. Excellent for Longhair cats, for multiple cats and for those who like to drink from a faucet, but of course, great for any cat as it offers every possible option. 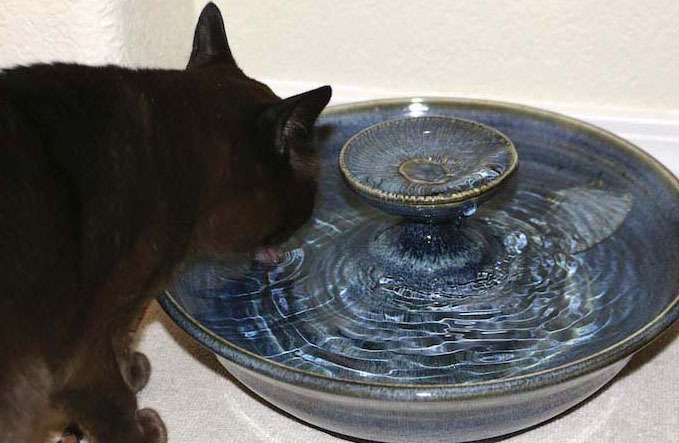 Note that we try to always leave enough room between the center piece and the side of the fountain bowl so any cat can easily drink from the bowl without feeling cramped. Do take a close look though because cats vary and not all fountains are the same. Some will have a little more or less room than others. 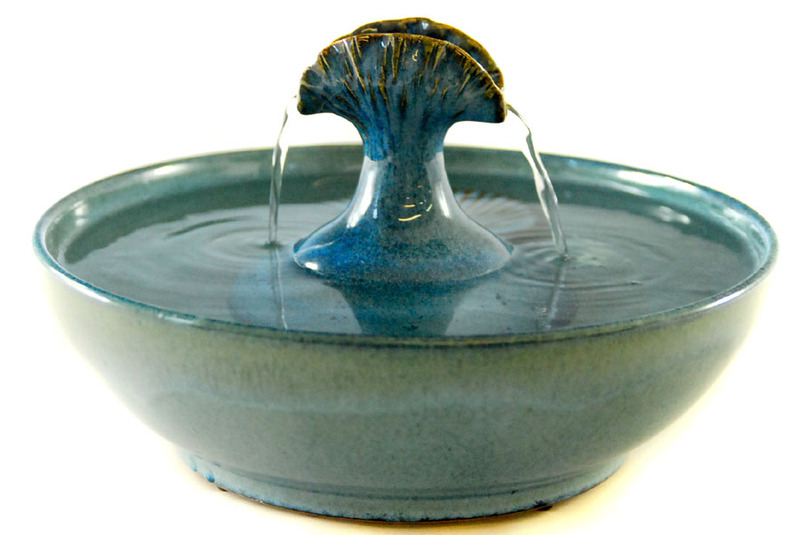 The Single Spout Piazza provides an upper basin, a bowl and single stream from which to drink. This is also excellent for Longhair cats and for those who like to drink from a faucet with multiple options for easy hydration. 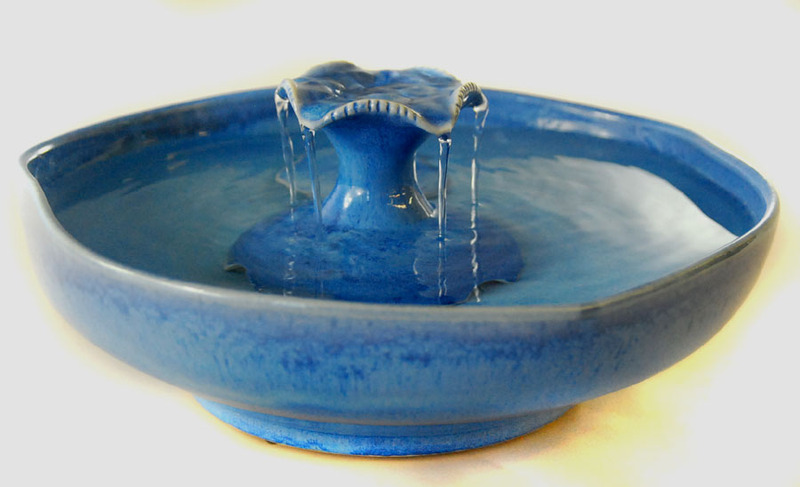 Because it has a smooth stream, particularly when run with the included ceramic insert which gentles the flow, this is a very quiet fountain which yet provides a very pleasurable visual display. It is surprising how many same-household cats enjoy drinking together. A multiple stream fountain with a raised basin is ideal for this, especially if they are long hair cats. Keep in mind that the pumps are all adjustable which makes it easy to find the right volume of flow for your particular cats. We create many more fountains with streams, a few of which we show below, in order of their quietness from most water sounds to least. Click the arrow on the right of the image to slide to the next. One of these design styles is certain to give you the best cat water fountain possible. Use the coupon code – watersounds for 10% off. Use the coupon code – water sounds 2018 for 10% off.